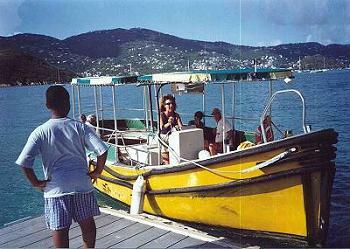 The colorful Water Island ferry is shown here pulling in to the Water Island ferry landing. 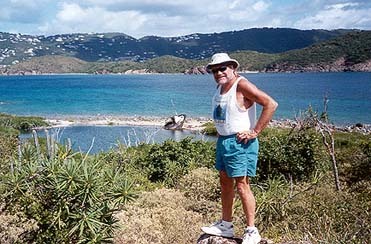 St. Thomas can be seen in the background. 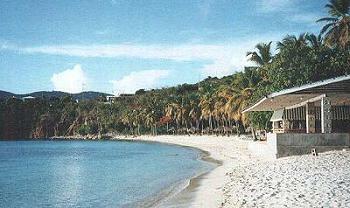 The ferry landing to the Island is only a ten minute cab ride from the St. Thomas airport. St. Thomas, St. John, St. Croix and the British Virgin Islands are all accessible because they are so close to each other. 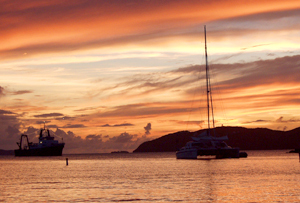 Virgin Islands activities include sightseeing, fine dining, duty-free shopping, excellent diving, sun bathing, historic tours, power and sailboat rentals, and even submarine rides. Click for more information on Water Island and the Virgin Islands. Honeymoon beach is a five minute golf cart ride from Villa Terra Nova. It is well known in the Virgins as one of the prettiest beaches in the islands. 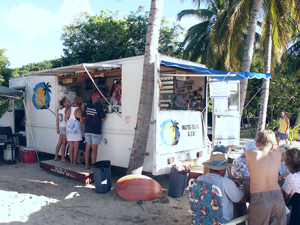 To dine on Water Island visit Heidi's Honeymoon Grill operating on the beach during the weekends and Saturday nights. 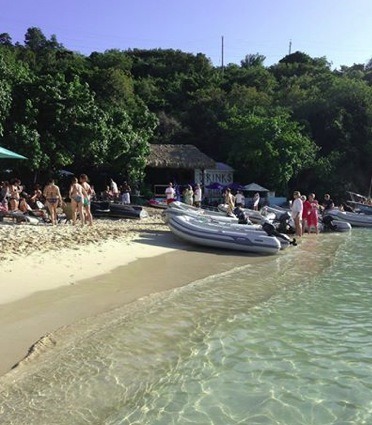 Dinghy's Beach Bar at Honeymoon Beach is quaint, fun and often features live music under the palms. 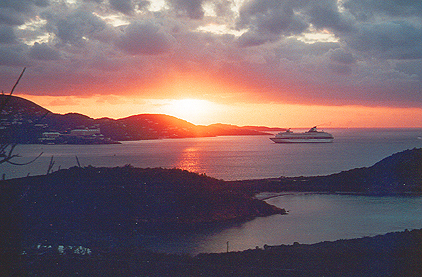 A cruise ship entering St. Thomas harbor at sunrise, as seen from the back deck. Beautiful palms at one of Water Island's beaches. Beautiful sunset over boats anchored in Honeymoon Bay. Water Island has interesting hiking. This is a scene from Sprat Point. 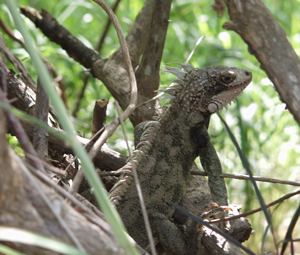 Many iguanas make Water Island their home. You may see one crossing the road or like this one, eating from a tree. Sailboats anchored in Honeymoon Bay.